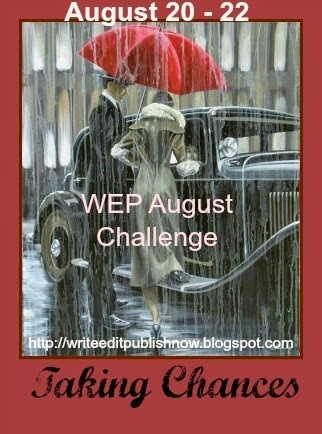 TIME TO SIGN UP FOR THE AUGUST WEP CHALLENGE...OPEN TO ALL...PLEASE JOIN US. PLEASE LEAVE A COMMENT AT WEP WHEN LINKING UP. SUBMIT your name to the Inlinkz list below NOW, or direct link on the due date - August 20-22. CREATE your entry for the monthly theme - August - TAKING CHANCES - 1,000 word limit. EDIT your entry then PUBLISH on your blog from August 22. Begin or end your story with these words…'There was once a chance I didn’t take.’ If posting photos, let the photos tell the story. Eleanor gazed at her reflection in the dressing table mirror. The dust motes had settled on the glass, she raised her hand, gently wiped the offending specks away. The difference was a more focused, aged face that stared back at her. Her eyes were still bright, the light burning behind them as fiercely as it ever did. She placed her chin in her free hand, she tilted her head this way and then that, the double chin quivered slightly, the tight grey curls caught the sunlight and shone silver in the mirror. She had celebrated her 80th birthday last year, never thinking in her twenties that she would be this old. The lined face that looked back at her showed the passage of time, a lived in face, one that had had its fair share of sorrow but also a larger share of joy and happiness. Eleanor attached her pearl earrings to her ears, placed the large string of pearls around her neck using the magnetic clasp, so useful with her arthritic hands, strapped her rose gold watch on, with the larger dial so she could actually tell the time these days, a quick check in the mirror as she moved from the bedroom to the front door to let her granddaughter in. Hayley embraced her grandmother, kissed her paper thin cheek, inhaling the rose scent of the weathered skin. Eleanor smiled at the young girl standing in front of her, beckoned for her to take a seat whilst she bustled around the tiny kitchen putting the kettle on to brew some tea. She placed homemade buns on a plate with an old fashioned cup and saucer for each of them. Hayley smiled, her Nan never ceased to amaze her. She looked around the bright room; her Nan knew how to make a small kitchenette very homely with pictures and a bright tea cosy over the teapot. The tea was poured, the buns offered, they munched in companionable silence. Then Hayley had to ask. Eleanor reached down to the magazine rack at the side of the table and withdrew a glossy magazine, one of those that catered for women of a certain age group with cooking recipes, knitting patterns, the agony aunt column, tips of what to wear and of course it always had some short stories in it. ‘Turn to page 30, my dear,’ was Eleanor’s reply. Smack bang in the middle of the magazine was a printed poem by Eleanor Carter. Hayley finished reading the article and looked at her grandmother. Smiling with tear laden eyes, she nodded sadly. Her main priorities are everything that she would leave behind. I can’t come with you when your firm sends you to work in England. All those years ago - there was once a chance I didn't take. Lovely sentiment and I really liked the visuals. I'm not sure I quite understand? Did she go or did she stay? What decision did she actually make? It sounds like a love lost to me. She couldn't leave her home and instead let the chance slip through her fingers? Too many commitments and ties? I like the way she worked it over in her mind trying to decide what to do. An interesting take on the challenge, revealing how we may not make 'that choice', but we don't forget what could have been. She says she had no regrets but it's a decision that has stayed with her for a long time. Eleanor thought long and hard about this decision, obviously keeping it close to her chest all these years. The poem told the story beautifully. The cycle of life is so interesting. But I'm not sure why she was putting on her pearls...does she go out after taking tea? I always love reading your English-touched stories Sally. Thank you. For the generation I had in mind the 'twin set and pearls brigade' - never fully dressed without perfume, necklace, earrings and watch, especially if you are expecting visitors. Life is just a series of choices, none of which guarantees anything. Taking the chance could have had better results but not necessarily. Things look pretty good for Eleanor who has a loving granddaughter. Nothing could be worse than to die alone, and Eleanor won't have that to face. Sometime there are reasons, unknown to us at the time, for the decisions we make, luckily Eleanor seems to have made the correct choice. It's an interesting story that left me a little confused about the stakes for Eleanor and the chance she didn't take. I think there is a point of view shift that threw me off somewhat--around the line where Eleanor announces she has a secret and then briefly slips into Nan's POV. Thanks for that feedback, I will watch out for that. Interesting take on the theme...that she has no regrets. I wonder why she told her grand daughter. I agree...sometimes we only know the decisions we took were the right ones - in hindsight. Thanks for your comment on my blog. Really appreciate it, Sally. I tried to put across the closeness of the generation gap, secrets a youngster might tell the older generation and reciprocated when the older generation does something slightly out of the ordinary or shares a secret not well known in the family. I loved your story. The poem was the best part. Don't we all have someone we turned down once, or at least didn't open up to? Eleanor's decision making is well captured in the poem, even though she had no regrets at the final choice, obviously it was a hard decision and the struggle to make the right choice has stayed with her. No-one can know at the time how the choices might play out, whether the right decision is being made or a huge goof up. Enjoyed the poetry. Of course, I am a little partial :) Just a little confused as to why she would make it public in a magazine? I think we've all had to make at least one decision like that, either saying yes or no to something, that changes our life. Of course, we never know how our life would have been if we'd gone the other way. I really enjoyed your post for this month's WEP! Loved the detail, down to the 'agony aunt column' - your description captures the moment and your poem the intensity of her decision. Very well done! I loved it! Oh my goodness, this is wonderful! I always enjoy your stories so much.